#InterStats Preview - Parma VS Inter: Can Icardi End His 6 Match Goal Drought? #InterStats Preview – Parma VS Inter: Can Icardi End His 6 Match Goal Drought? Inter are winless in 2019 in the Serie A as they travel to Stadio Ennio Tardini to face a highly spirited Parma side, who staged a comeback last weekend against Juventus from being 3-1 down to draw 3-3, becoming only the third side to have taken a point from the league leaders. No goals in 3 Serie A games this year, Inter have not score more than once since 2nd December vs Roma. Mauro Icardi, is the club’s leading goalscorer with 9 goals, hasn’t found the back of the net in 6 games now, his longest goal drought for Inter ever. Matteo Politano, the club’s best assist provide at 3 and the player that has created the most chances with 33, will serve his last match suspension but Keita Balde returns. Keita scored the Nerazzurri’s last Serie A goal against Empoli just before new year and is the second top scorer after Icardi with 4 goals. Inter are one of the four teams together with Chievo, SPAL and Torino, that are yet to score a goal through a counter attack. Gervinho has together with Robert Inglese scored 67% of the goals Parma have scored this season, netting 8 goals each. Inter have the second best defence in the league but have only kept a clean sheet in one of their last 5 away games which came against Empoli. Marcelo Brozovic has won 65 tackles, made 31 interceptions and also blocked 23 passes, the highest among his teammates. Milan Skriniar has blocked 20 shots and has also made 74 clearances, winning more aerials duels (36) than any of his teammates. D’Aversa’s men have conceded at least one goal in their last 4 matches. Roberto Gagliolo has all the top numbers in the defensive areas: most clearances (136), most tackles (47) and most interceptions (49). Marcelo Brozovic has the best passes per game average in the Serie A with 81.7, while Borja Valero has the best passing ratio in the team with 93.6%. Inter are the best team in keeping possession (56.3%) but seventh in chances created and also 4th in terms of pass accuracy (85.8%). The Gialloblù are the worst side in the league with regards to possession (40.7%). Leo Stulac has created the most chances in the team (17). Do you have a stat you want us to highlight? Discuss in the comments below. 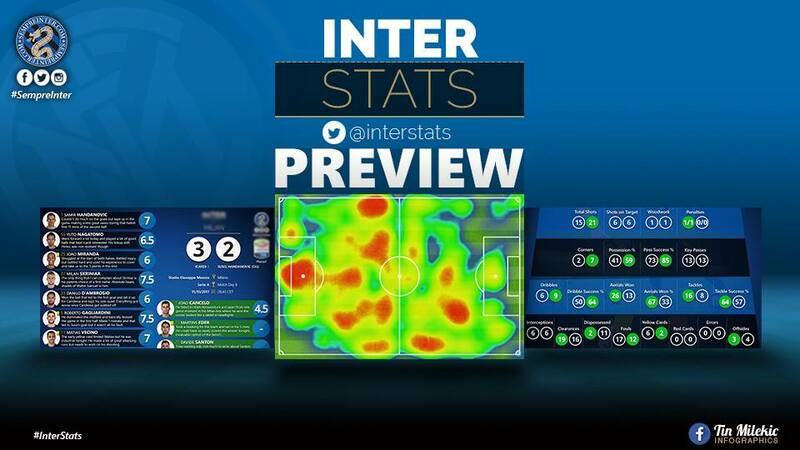 Hit us up on InterStats & SempreInter on Twitter using the #InterStats and #SempreInterLIVE before, during and after the game for unrivaled quality coverage of the fixture.